The compact BLUNT XS METRO is the perfect balance between portability and performance, the ultimate travel mini umbrella. Every BLUNT umbrella features patented BLUNT tips that form an integral part of its unique Radial Tensioning System (RTS). A system that redirects, transfers and distributes the effort used in opening the umbrella throughout its entire canopy surface. This revolution in umbrella design creates an aerodynamic robust canopy structure, making BLUNT umbrellas the ultimate windproof defense against the elements. Diameter: 950 mm / 37"
Coverage: 580 cm / 90"
Length: 365 mm / 14"
Gessato is an authorized retailer of Blunt Umbrella products. 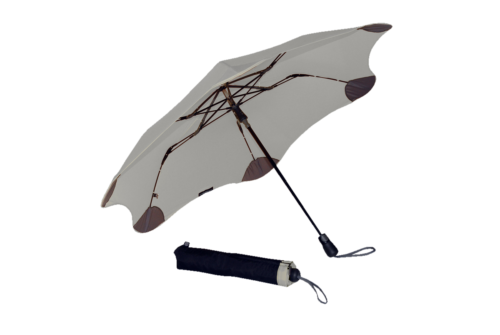 We purchase all of our Blunt Umbrella products directly from the company in order to bring you genuine items that represent the best in contemporary design. Every Blunt Umbrella product in the Gessato shop is authentic, comes with official brand packaging, manufacturer’s warranty (where applicable), and is sold with Blunt Umbrella's authorization.